marinara sauce w/ ground turkey + zoodles. this was good and easy – I’ll definitely keep this recipe on hand. slow cooker chicken & butternut squash + sweet potato. this was delicious and I’ll post the recipe this week! And my final overview. I am ending my Whole30 a couple days early, but with good reason. Unfortunately I have not had such a positive experience with it as most people. Unfortunately, my digestive system has been off-kilter the entire time. I wanted to give my body time to adjust but it only did literally in the past 2 days. Although I figured out the Whole30 may not have been completely at fault for this, it is true that many veggies are more difficult to digest and I think the increased intake was just too much. As I’ve said, I did feel mentally better simply eating better, but the other downside was that it was difficult to have the energy to do my typical workouts. I know it’s possible, since other people do it, I just don’t have the time or money or commitment to continue to keep dramatically changing my diet. I obviously don’t want to go back to eating a bunch of crap. The plan is this: limit my dairy, grains, sweets [as in never buying any myself, only indulging for special occasions]. And honestly, my typical diet is not that bad (apart from my long binge between Thanksgiving and New Years). I don’t regret doing the Whole30, but if you’re considering it and know you have a sensitive stomach, consider it very carefully. It may help or it may hurt. I hope it helps! If you’ve been following my Whole30 journey – thanks! I do still post pretty regularly on my blog apart from these posts, so hang around and I hope you continue to follow! Categories: Sunny Sunday, Whole30 | Tags: cooking, food, Whole30 | Permalink. This was super easy and has a good flavor. You can eat as is, or cook up some protein and add it in at the end! This recipe is good for Whole30 or non-Whole30, just change what you serve it on. For Whole30 I served over zoodles…..and threw in a sweet potato as I do to most meals. And don’t worry….I definitely went back for seconds! Chop the onion and mince garlic (or use pre-minced). Place in bottom of crock pot. 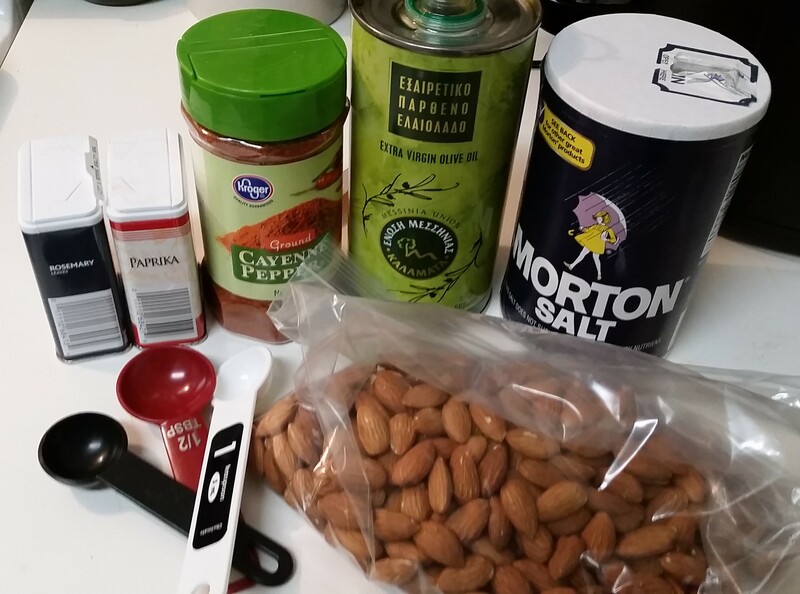 If adding a protein, cook the meat and season with Italian seasoning when it is close to 8 hours. Once cooked, pour into crock pot and stir to combine. Recover to let finish heating or let it sit on warm for 20-30 minutes. Categories: Spirited Saturday, Whole30 | Tags: cooking, food, recipes, Whole30 | Permalink. I think I’m finally getting the hang of this. I think I just wasn’t eating enough for my metabolism and/or workout habits, and I think the biggest downfall was breakfast. So I simplified it and have way more energy this week. I also simplified all my meals (save one dinner as I had shrimp that needed to be used) by using the crock pot so the week was way less overwhelming. I’m not going to lie, though – we cooked dinner at a local transitional shelter and baking cookies was the WORST. Definitely the biggest temptation so far. Here’s the breakdown from Week 3 – 9 more days to go! Breakfasts: Hard boiled egg(s) + 2 sausage patties + strawberries + blueberries + banana. The number of eggs (1 or 2) and whether I had a banana or not depended on my workout for that day. Strenuous workout = more food. 🙂 I did some scrambled eggs on the weekend but basically kept everything the same! Lunches: taco chicken + lettuce + bell peppers + shredded carrots + avacado + salsa. I tried to use romaine as a taco shell the first day, but that proved to be way too messy – especially since I usually eat and work at the same time. So the rest of the week was “taco” salad. And it made enough to get me through the weekend also! Dinner: sticky shrimp + steamed broccoli/cauliflower + sweet potatoes. I haven’t had time to post the shrimp recipe (maybe later) but it’s linked to where I found it. It was definitely not an ‘easy’ one but I had shrimp I had to use – and it was VERY good. I also had fun cutting the sweet potatoes using my still new-ish spiralizer. Dinner: “creamy” chicken & tomato soup. A yummy crock pot recipe. Makes so much I’ll probably use it for lunches next week. One night I stirred in some mixed greens. One night I ladled it onto some zoodles. Yum. Dinner: cilantro lime chicken + zoodles + sweet potatoes. Another great crock pot meal (I’ll post the recipe this week)! Normally would go on rice, so I just sautéed some zoodles with some chili powder. And the sweet potatoes totally didn’t fit but I needed something with carbs since I was doing a 5K the next morning. Random-looking but all delicious! There were of course little snacks of Lara bars or nuts when needed. 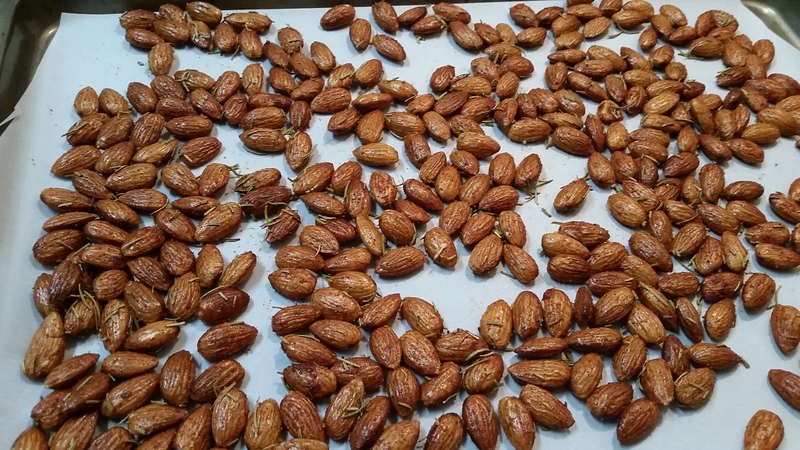 I did find a very delicious roasted almond recipe that I will post soon. Heading into the home stretch!